The Slovaks are an ethnic group native to Slovakia. Slovakia, a member of the European Union, is situated in the heart of Central Europe and its language, Slovak, is said to be mutually intelligible to most other Slavic languages. Its capital city, Bratislava, is on the Danube. There are six data sets that have been incorporated into DNA Consultants’ method. The Slovak – Presov population data represent DNA samples from 138 Eastern Slovakia Caucasians from the town of Presov. The Slovakia – Abov-Gemer population data represent DNA samples from 522 randomly selected, unrelated individuals from the eastern Slovakia region of Abov-Gemer. Historically the region was relatively isolated with its own distinct dialect. The Slovakia – Šariš population data represent DNA samples from 424 randomly selected, unrelated individuals from the eastern Slovakia region of Šariš. Historically the region was relatively isolated with its own distinct dialect. The Slovakia – Spiš population data represent DNA samples from 148 randomly selected, unrelated individuals from the eastern Slovakia region of Spiš. Historically the region was relatively isolated with its own distinct dialect. The Slovakia – Zemplín population data represent DNA samples from 279 randomly selected, unrelated individuals from the eastern Slovakia region of Zemplín. Historically the region was relatively isolated with its own distinct dialect. The Slovakian population data represent DNA samples from 247 randomly selected, unrelated individuals of Slovakia. STR frequencies were reported in the most recent European database release of the Working Group of the European Network of Forensic Institutes STRbase Project (Frequencies). 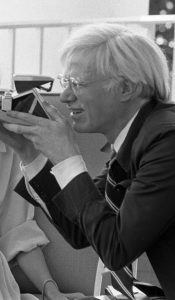 Photo: Andy Warhol, renowned pop artist was born to Slovakian parents in 1928. Photo is from Series: Gerald R. Ford White House Photographs, 8/9/1974 – 1/20/1977. Source publication: Slovak – Presov (population #399): Genetic variation analysis of 15 autosomal STR loci in Eastern Slovak Caucasian and Romany (Gypsy) population, FSI, 2008, p21-25. Slovakia – Abov-Gemer, Šariš, Spiš and Zemplín (population #411-414): Population database of 17 autosomal STR loci from the four predominant Eastern Slovakia regions, FSI, 2011, p262-263. Slovakian (population 450): ENFSI DNA WG STR Population Database v. 2. (strbase.org).